If you raise animals you naturally end up with lots of empty feed bags. It's such a shame to just throw them away because they are often really beautiful, and they all are sturdy and water-resistant. I decided to try my hand at growing some shallow-root cold crops in feed bags for the first time this year. 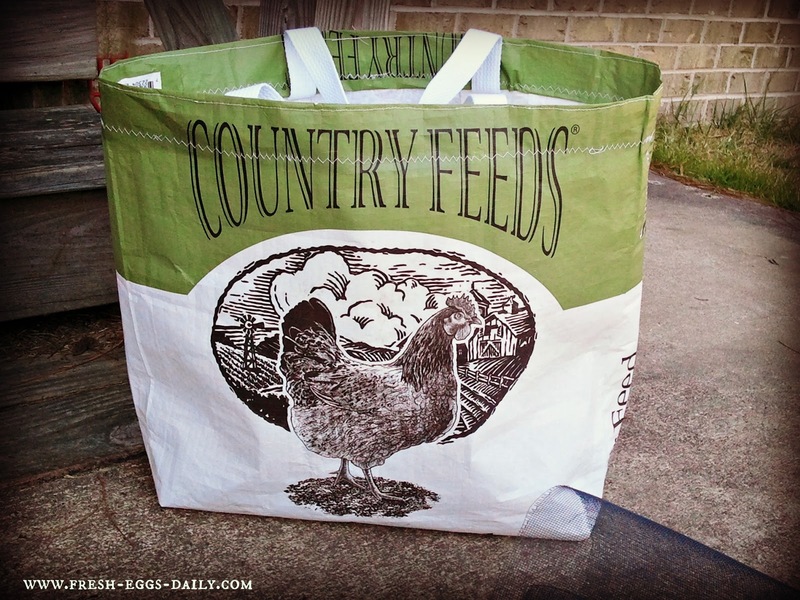 We use our empty horse feed bags as trash bags in the barn and I make many of both the chicken and horse feed bags into market totes that I sell on Etsy HERE. They are great for the grocery store, beach or for your knitting. If you want to learn how to make your own tote bag, read more HERE. 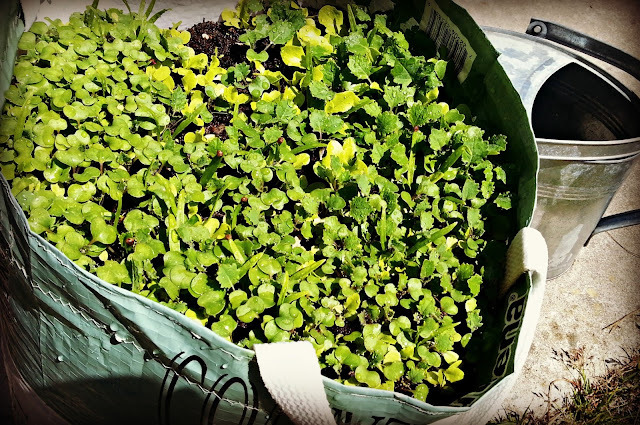 But I knew there had to be more I could do with our empty feed bags, and as I was getting out some seeds early in January to start planting some cold crops of lettuce, kale and Swiss Chard, I realized I could make a patio planting 'container' out of a feed bag. I gave it a shot and it was so easy and came out so cute! It's functional and light enough that I can move it around the patio as needed into the sun or shade. The bag drains really well but also holds moisture. First I cut off a bit of the top and the bottom of the feed bag. I wanted the container to be a bit shorter than a regular tote bag so I cut off about 8 inches from the bottom and four inches from the top, centering the part of the bag I wanted to feature. 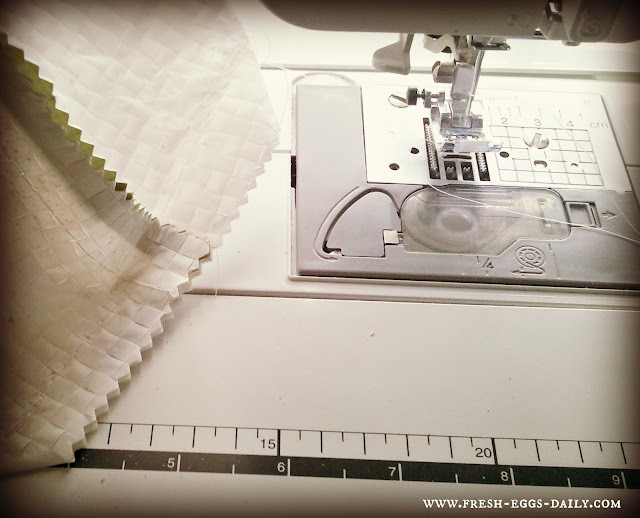 I turned the bag inside out and sewed a straight line across the bottom edge, leaving a 1/2" seam allowance. 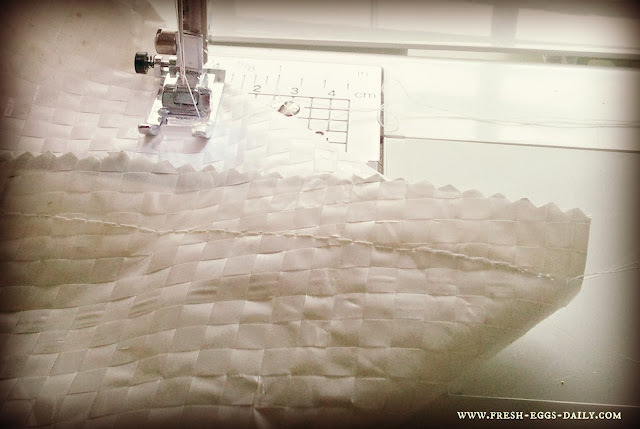 Then with the seam side facing up, I folded each bottom end into a triangle to form the flat bottom and sewed across each diagonally, about four inches from the point. I cut cleanly across, removing the triangle tip of each end, again leaving a 1/2" seam allowance. 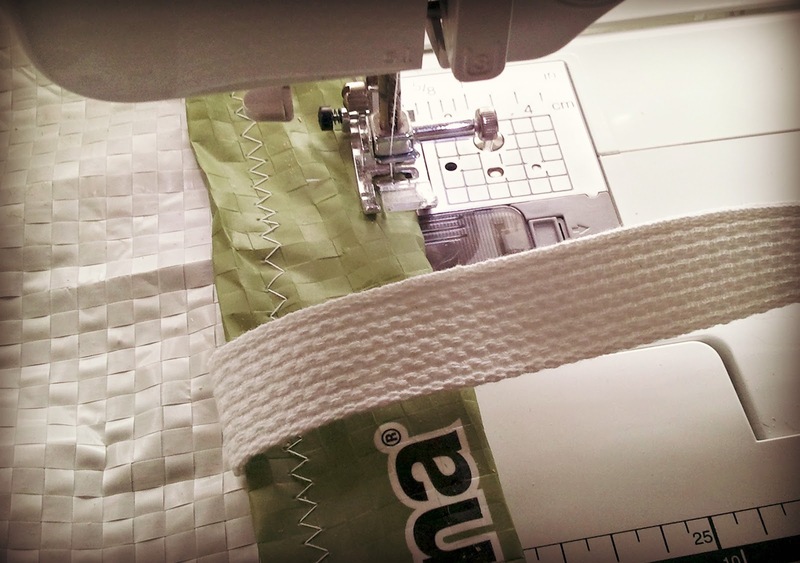 Next I folded the top of the bag over twice and pinned some cotton webbing in place to make handles. I made the handles shorter than I do for the tote bags since they would only be used to move the bag on occasion as needed. After sewing a zigzag stitch along the lower seam, I flipped the handles up and sewed a straight stitch seam along the top edge to secure the handles in place. 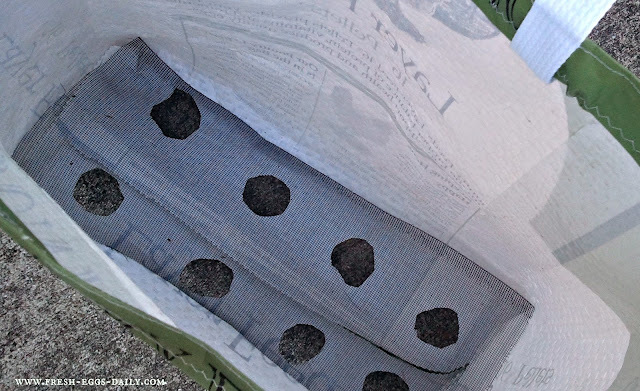 I turned the bag right side out and cut some generous drainage holes in the bottom with scissors and then cut a piece of window screen to fit on the bottom to help hold the soil in the bag and put it in place. Here's my completed 'gardening container'. 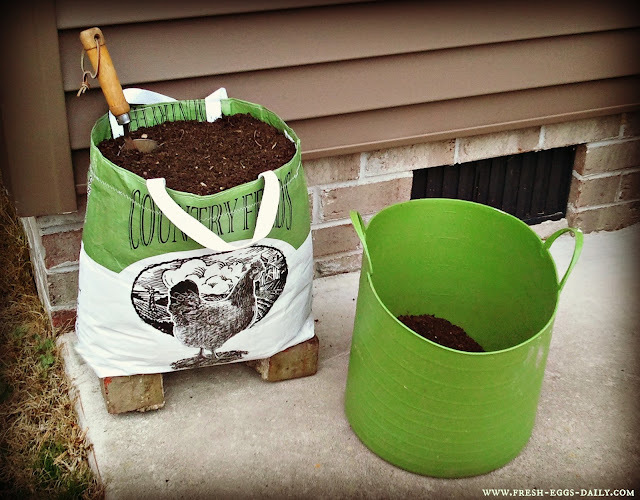 I placed the bag up on two bricks on our back patio to elevate it off the ground and allow for better drainage and then filled it to within an inch of the top with some composted soil from our compost pile. I planted some lettuce, kale and Swiss Chard seeds and then covered them with more soil and watered them well. A wide variety of mini crops can be planted in a bag container like this. I chose cold weather crops that are hardy enough to be planted this early in the year but other vegetables with shallow root systems would work just fine as well. Strawberries would make a beautiful bag of goodies also. 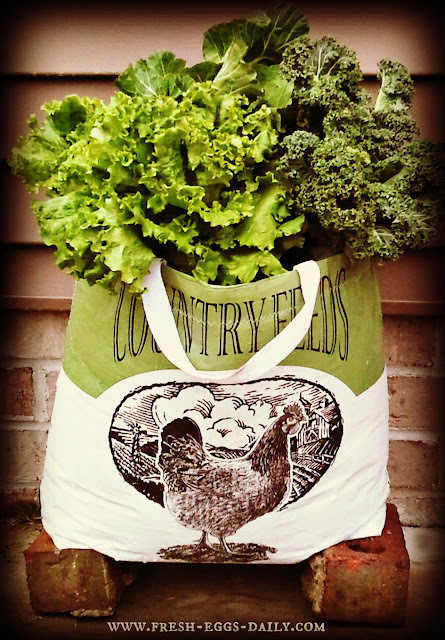 In a week or so, your bag should look like this and in a few more weeks be ready for picking! 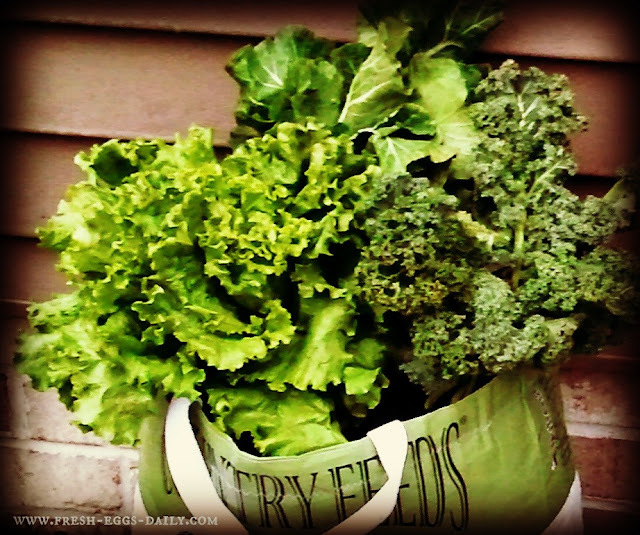 And what could possibly be better than fresh greens right by your back door? 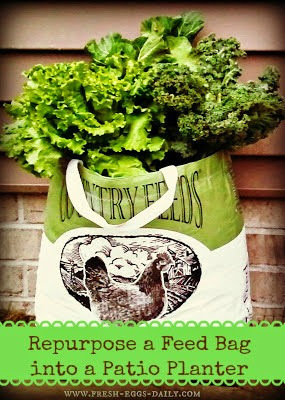 The bags can be emptied, rinsed off and reused, or used several times through the growing season for different harvests. Cute idea, I've made the totes before, but I still have a stack of chicken feed bags waiting for some inspiration. 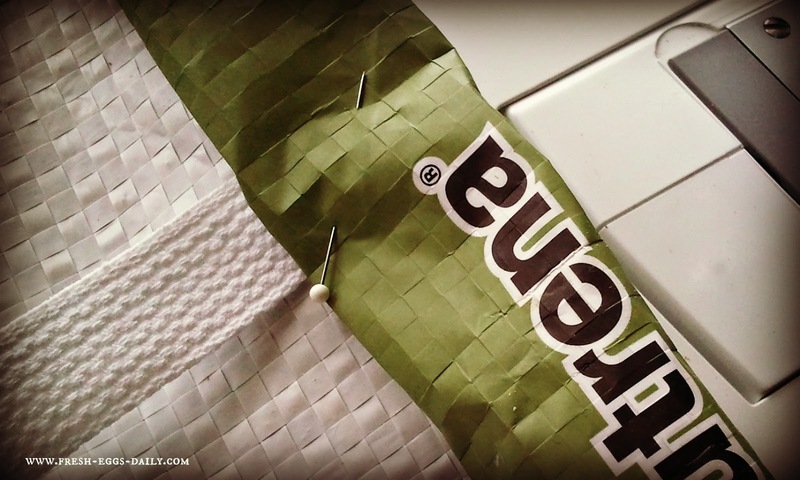 Do you use special thread? Dropping in from Thursdays Favorite Things. Love this bag, mom and dad own a pet store so I'm thinking a couple of the larger (non-paper) dog food bags would make excellent flower pots for just outside the entry. Thanks for sharing. I sewed a round piece of bag to the bottom of the bag and where the side seems came together over lapped them but did not sew them completely shut. I grew potatoes in them and I can stick my hand inside the soil and grab potatoes as I needed them! I also sewed a sack into a cover for the cushion on our milking stoolo, stays cleaner that way! 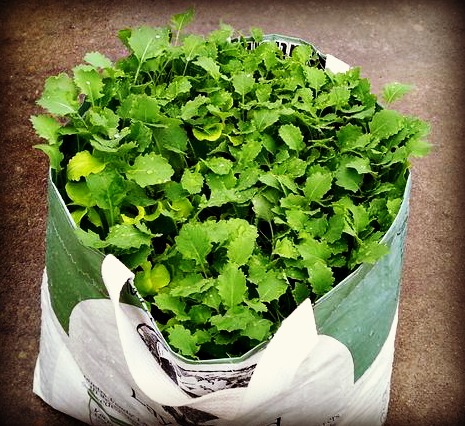 Been thinking about sewing them into bags about half as wide, filling them with soil, tying the ends shut and laying them on the ground or along the driveway to grow flowers in, just cut slits for each plant and maybe a few cuts along the bottom for drain holes? I have seen similar where they run drip lines or soaker hoses directly through a fabric type bag. This is a great idea. Regular plant containers are heavy, hard to move, and hard to store and prone to breaking! I'm going to start saving my bags. Instead of a screen in the bottom could you put some peat moss instead? 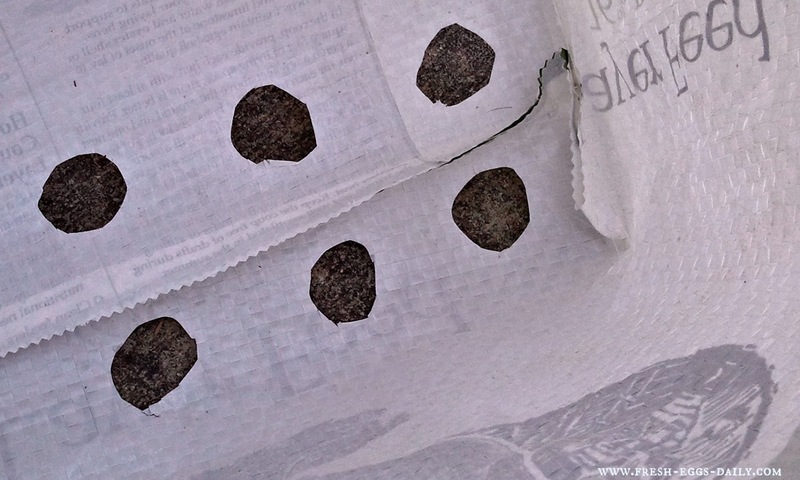 I suppose you could, also some stones or pebbles if you cut smaller holes in the bag. 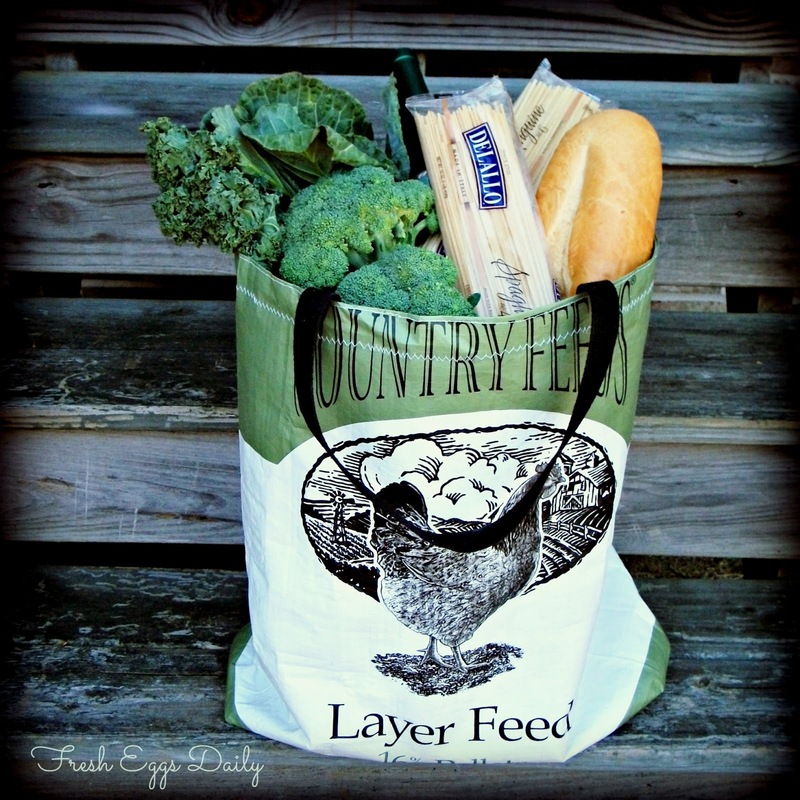 Love this idea, never know what to do with all those feed bags, thanks for some inspiration! We have a lot of sacks that we have saved. Looks like a good thing. We save all of our sacks. We are using the mineral tubs that cattlemen use. They just throw them away. We are using them for root crops also and flowers and herbs. What a wonderful way to give new life to something so cool! These are really pretty and I love this idea! 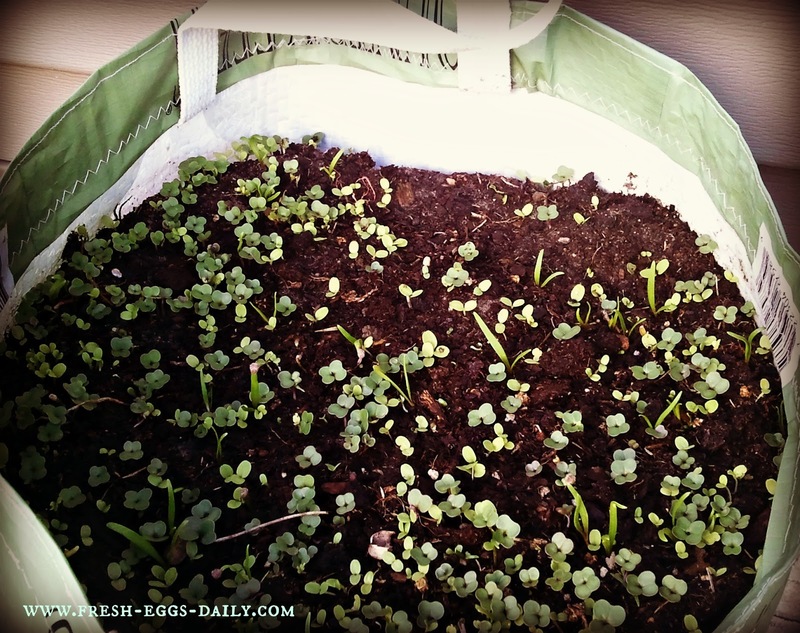 Thanks so much for sharing this on Waste Not Want Not Wednesday, Lisa :) I’ve pinned it. Cool idea! Thank you so much for sharing it on Wildcrafting Wednesday! This is really cute...what a fun idea. Thanks for sharing! I love this idea! I can see using this for my daughter and I to grow flowers. This is fabulous. Wouldn't these be cute hanging off a deck railing?